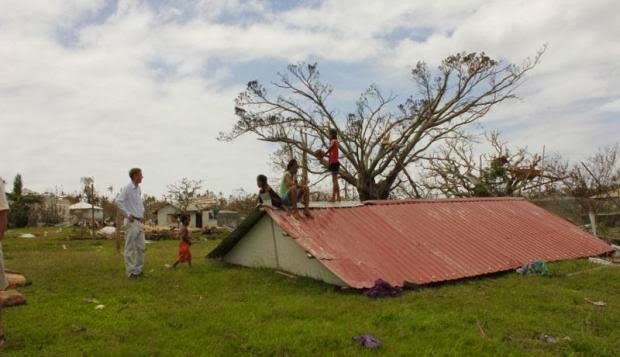 The Labour and Mana parties are rightly criticising New Zealand’s government for not offering more assistance to Tonga in the aftermath of Cyclone Ian, which has levelled hundreds of buildings and displaced two and a half thousand people in the Ha’apai archipelago. The National government initially offered a pathetic fifty thousand dollars to help the victims of Cyclone Ian, and has since increased its assistance to half a million dollars. National’s stinginess is related to the struggle it has been conducting against Tonga’s government for the last year. Along with its allies in Canberra and Washington, the New Zealand government has been alarmed by the warm relations Tonga has lately established with China. Much of Tonga’s substantial foreign debt is now owned by China, and Chinese now dominate business in the Tongan capital of Nuku’alofa. Last year Tonga’s government attempted the de facto nationalisation of the country’s domestic air service, by forcing out the New Zealand-owned company that had run local flights and introducing its own service using Chinese-made planes and Chinese pilots. New Zealand’s government responded by questioning the safety of the Chinese planes, advising Kiwis against using them, and threatening to cut aid to the country in half. The mean-spirited response to Cyclone Ian is another attempt to punish the Tongan government for its alliance with China. The miserable response of John Key and co to Tonga’s plight contrasts markedly with the way that Tongans reacted to a recent disaster in New Zealand. A few weeks after the earthquake that partly demolished their city in September 2009, the people of Christchurch received an unexpected gift: a cheque for eight hundred and thirty-three pa’anga – that is, about six hundred thousand New Zealand dollars – raised by the people of Tonga. Tonga is one of the poorer nations of the South Pacific – a Tongan manual labourer can expect to earn two pa’anga an hour, and many Tongan houses are no larger and no more robust than the average New Zealand garage – but when the sufferings of Christchurch were discussed at church meetings and at school assemblies, donation boxes quickly filled with cash. On a per capita basis, Tongans donated far more to the relief fund for Christchurch’s earthquake victims than New Zealanders. Their generosity might seem all the more surprising, given that Christchurch is located a long way from tropical Polynesia, and boasts only a small community of expatriate Tongans. The Tongan response to Christchurch’s tragedy has to be understood in relation to Tongan notions of family. The extended family, or kainga, is a crucial part of Tongan society, and membership of such a family implies both giving and receiving goods and services. Even if he lives in the city, and lacks the time or the desire to maintain his own farm, a Tongan is obliged to help his siblings and cousins work their plantations, and entitled to a share of their harvests. If a Tongan earns a wage or a salary, then members of the extended family will likely take a cut. If a Tongan runs a store, then siblings, uncles and aunts, and cousins will enjoy generous discounts there. The intricate system of obligation and exchange that dominates life in Tonga extends beyond the kainga and influences relations between nobles and commoners. Tongans who live on land administered by nobles may, for example, be obliged to attend the wedding of that noble’s child or grandchild, and to bring along pigs and tapa cloths as offerings, and to dance and sing in celebration. The word fatonia, or duty, is often used to describe the quasi-feudal relations that Tonga’s nobility sometimes still imposes on commoners. Within the kainga, though, fatonia plays a more positive role. It can see more powerful and wealthy family members providing for poorer and weaker cousins. Fatonia demands that widows and orphans be adopted and fed by the kainga. Despite its poverty and its lack of a welfare state, Tonga is not a place where the poor die of hunger and homelessness. My wife and I got a lesson in the kainga system when we settled in the Nuku’alofa suburb of Halano last February. Soon after we’d moved into a sweltering house in the shadow of the local Mormon church, neighbours began visiting with bags of taro, bananas and fish. After I went on television to talk about the classes I was offering at the ‘Atenisi Institute, former students of the school also began to visit with gifts. When we accepted the bananas and the fish, relations were established. Soon I was tutoring neighbourhood children in English and in history, and my partner was offering bags of food – bananas and taro bought from the Nuku’alofa market, not pulled from a plantation – to friends. The generous response to Christchurch’s misfortune reflected Tongans’ belief that they enjoy a family relationship with New Zealanders. Decades of emigration have created sizeable Tongan communities in several New Zealand cities, and turned certain parts of Auckland – Walmsley Road, for instance, which runs between mangrove swamps and churches to connect Otahuhu with Mangere – into virtual Tongan colonies. Most Tongans have friends and family members living in New Zealand, many of whom regularly send money home. The sense of a close, reciprocal relationship between Tonga and its giant southern neighbour is often expressed when sport is discussed. During last year’s Rugby League World Cup, I was repeatedly told that the Kiwis were ‘really’ a Tongan team, because they boasted several Tongan-born players. As I liked to point out in response, though, the team Tonga sent to the World Cup included several players who had been born and raised in New Zealand, and had never visited the land of their ancestors. Now that Cyclone Ian has rampaged through the Ha’apai archipelago, rendering seventy percent of houses on some islands uninhabitable, Tongans are understandably keen to see the generosity they showed to Christchurch reciprocated. John Key’s government is letting them down. I'm against NZ bullying Tonga's government, but such a position shouldn't, I hope, imply support for the agenda of Tonga's government. Here's the broader aid figures to give some sense of the scale. The 500k figure is 1/1000th of our total aid allocations for the year. For the Syrian crisis, acknowledged by the UN as the great humanitarian crisis of the century our govt has pledged less than 1/100th of our total aid allocations. In a two year period, we've cut $33m from our aid budget. Great post Scott. We have a tiny Tongan community in our small West Coast town, sadly made smaller by a dual fatality car crash before Christmas. My family have been finding ways to reach out and offer support - I'm shamed that we didn't reach further out earlier.